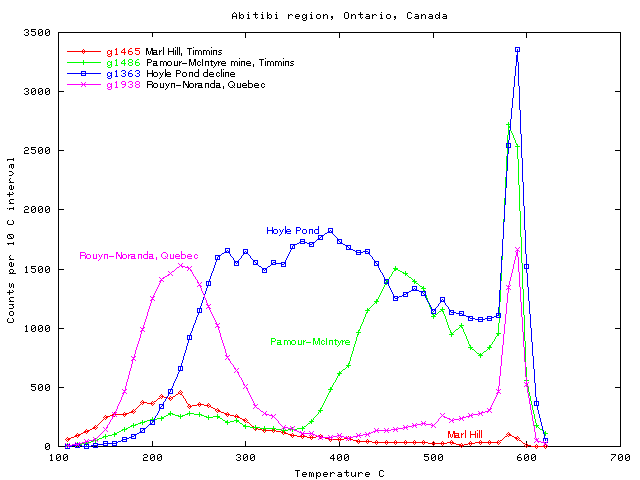 The Archean deposits in the Abitibi belt, Ontario, Canada have been shown by other workers (T.J. Smith, S.E. Kesler) to have abundant CO2 rich fluid inclusions present. Decrepigrams of samples from numerous deposits in this region show low temperature decrepitation peaks caused by these CO2 rich fluid inclusions, in agreement with this other work. The samples in this figure also show a great range of variation of decrepitation behaviour at higher temperatures. Decrepitation is a simple means of identifying the veins containing CO2 rich inclusions. Because such veins are strongly correlated with Au mineralization, decrepitation is a useful exploration technique for these types of deposits. Archean and Proterozoic Au deposits commonly contain an abundance of CO2 rich fluid inclusions. The Mt. 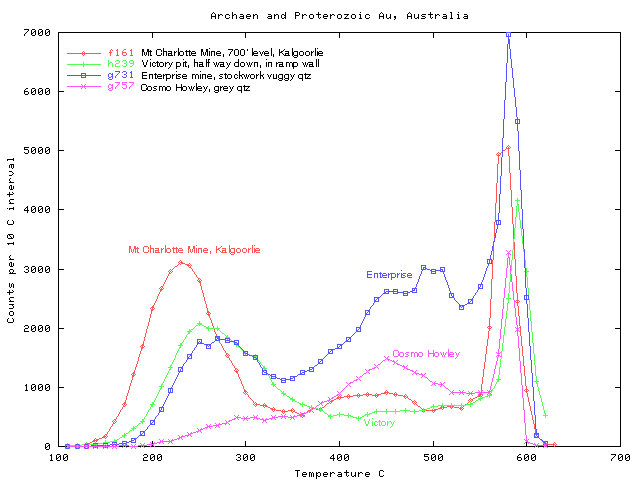 Charlotte and Victory mines are Archean greenstone hosted deposits near Kalgoorlie, WA. 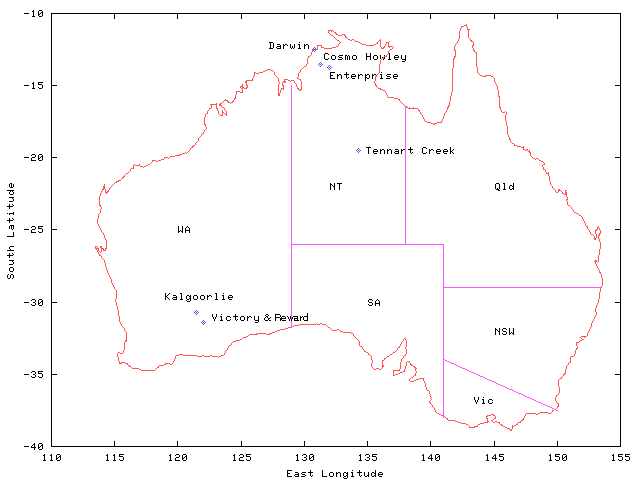 The Enterprise and Cosmo Howley deposits are hosted by proterozoic sediments in NT., Australia. All of these samples show prominent low temperature decrepitation caused by CO2 rich inclusions. Although this peak is subordinate at Cosmo Howley, it is still quite significant and occurs as a broad region of decrepitation commencing near 200oC. Note that the sample from Cosmo Howley mine was mapped by the mine geologists as "Chert". However, decrepitation shows that this is actually a quartz sample because chert samples do not contain measurable fluid inclusions and do not decrepitate. Moreover, chert samples certainly do not contain CO2 rich fluid inclusions as this sample does! In this case, decrepitation enables correction of geological misidentifications. At this mine the entire geological model was based on synsedimentary stratiform Au in cherts, and the decrepitation data shows that this model was wrong. The deposit is most likely an epigenetic replacement of carbonate horizons by auriferous quartz and the decrepitation data is instrumental in resolving this controversy.